In its first meeting after the coming into force of the Treaty of Lisbon, EU Tourism Ministers approved the “Madrid Declaration”, making a series of recommendations to the European Commission to implement a European tourism policy for the first time in the EU's history. Both also coincided on the fact the ageing of the European population allows for policies that contribute to the sector no longer being seasonal and makes it possible for tourism to be maintained in the low season. The declaration places emphasis on the role of innovation and information and communication technologies for maintaining the competitiveness of tourism companies, largely SMEs, in a globalised economy. In this respect, Commissioner Tajani expressed his satisfaction of “inclusion of the word tourism, also for the first time, in the EU 2020 Strategy" and indicated that awarding credits to SMEs will be dealt with by the Commission in a meeting in Brussels on 9 May. Jointly working on promoting European destinations in far-off markets, is one of the EU's priorities. This means, according to Sebastián, “promoting the Europe brand” abroad, by campaigns to improve the cultural, historic and gastronomic heritage image of European destinations. This gives rise, said the Minister, to the need for a new visa policy that “does not strangle demand” from the new tourist-generating countries, especially India, China and Russia. Making progress in consumer protection by harmonising legislations, as well as integrating sustainability in tourism-related sectors, was also discussed (transport, waste treatment, water management, among others). The Spanish Presidency presented the Europe Senior Tourism project in the meeting. This is a pilot experience that facilitates the transfer of European citizens to Spanish destinations in Andalusia and the Balearic Islands, and will shortly also include the Canary Islands. According to the Minister, a total of 50,000 Europeans from 16 countries (Slovakia, Netherlands, Belgium, Poland, Slovenia, Hungary, Italy, Austria, Greece, Portugal, Denmark, France, Czech Republic, Romania, Bulgaria and Ireland) have travelled to Spain under this programme. 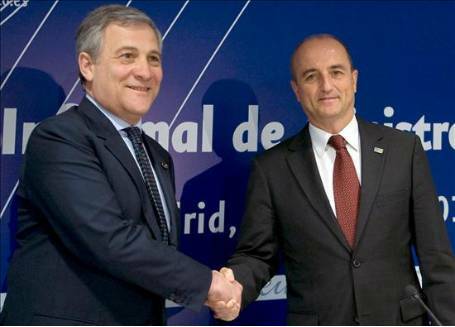 Commissioner Tajani said he was convinced that the Madrid Declaration is a decisive contribution to “Communication on the EU's new tourist policy framework”, that the Commission will present to the European Council before the end of the year. Download the Madrid Declaration in PDF format from the right-hand panel. (3) Facilitating the access to holidays to groups with impaired mobility or those who are socially and/or economically disadvantaged, promoting as the same time a better and more prolonged use of tourist infrastructures, the maintenance of tourist activity in the regions for longer periods, and a strengthening of the feeling of European citizenship".